Miles attends a private school where he lives with his best friend Ganke. He's on scholarship for his room and board and while his parents are still struggling to keep up with his tuition, they are happy to give Miles the opportunity to get out of the neighborhood that led to his uncle Aaron becoming a criminal. 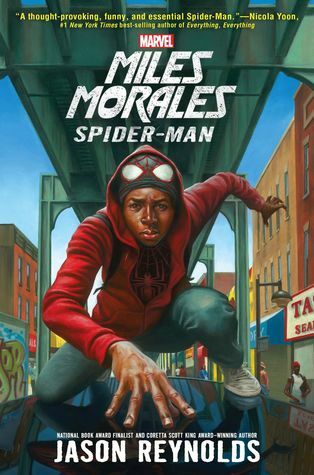 Besides struggling with expectations - his parents' and his own - Miles also has to deal with his secret identity as Spider Man. After being bitten by an enhanced spider at his uncle's house, Miles developed spider-like abilities which he uses to help stop crime. His father and Ganke know he's the Spider Man, but no one else does. Lately, Miles' spidey-sense seems to be malfunctioning. Every time he is in his history class with Mr. Chamberlain he feels it buzzing but when he leaves class to see what's happening, it stops. Eventually, Miles wonders if it's Mr. Chamberlain himself who is setting it off. He's definitely a mean teacher but he has also recently been writing racist statements on the board and talking about the benefits of slavery during the Civil War. Jason Reynolds, as always, is amazing and has presented us with a layered story which will be a surprise to those picking this up just to read about Spider Man. Just as he did in When I Was the Greatest, Reynolds fills the neighborhood barbershop with strong characters who really make you feel the local vibe and issues plaguing their streets. There are never any throw-away characters in a Reynolds book and there are always layers of storytelling. This being a superhero book, of course there is the somewhat dark origin story. But on top of that there are the issues with being not-white in American society in education, the prison system, profiling, and more, all of which are brought into the story without a blatant arrow pointing them out. The only problem I have with the book is that it doesn't focus enough on Spider Man. Miles and his problems are fully explored but the superhero aspect of his life mostly takes place pretty close to the end of the book. I would've liked to have seen more webslinging action throughout as well as a little more lead up to the evil big boss.